AHEAD has memorable keepsakes to match any budget! Package up AHEAD’s items in a personalized gift box, and make a great impression on your guests. Boxes may contain combinations of headwear, metal & leather accessories, golf towels, blankets, and apparel sized up for each recipient. What's more, the items come preassembled so all you have to do is hand them out, and shake hands! Nothing says "golf" more than gloves and pinflags. AHEAD’s latest "2 sizes fits all" takes the worry out of having to predetermine the sizes of all of your tournament participants. Pinflags eliminate the need for sizing, altogether! See the AHEAD Accessories catalog on this site for even more ideas. Money Clips, Bagtags, & Divot Tools... oh, my! Custom metal items make a terrific impression, and tend to last the test of time. These accessories will continue to stir up memories of your event years after your playing partners have signed their scorecards. Looking for something more unique? Check out AHEAD’s custom Bottle Openers and Holiday Ornaments! AHEAD also offers an assortment of in-stock accessories for quicker shipping. Short on Time AND Budget? Think ChromaPlate! AHEAD’s exclusive ChromaPlate technique allows you to order full color, imprinted custom accessories in a pinch, and for even smaller quantities than with off-shore programs. 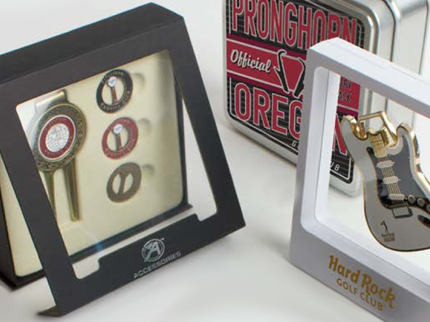 Choices include bag tags, medallions, and divot repair tools... oh, and you can assemble them in ChromaPlated collectible tins that are sure to stay on your office desk for years!